Research has proven the human body to be like a computer, made up of the brain (electrical generator and memory bank) and thousands of miles of electrical wires called nerves. These nerves connect every organ, gland and tissue of the body. These nerves also connect with "fuses" or "breaker switches" called contact reflexes. By contacting these reflexes, using the body's muscular system as an indicator, we are able to monitor the function of body systems. Contact Reflex Analysis (CRA), simply stated, is an energy connection. It is a technique that utilizes a muscle response as an indicator and assessment of the energy status of each organ, gland, system, or structure. This energy assessment is accomplished by testing one or more reflexes, which are similar to acupuncture points and meridians, and monitoring the reactance of the muscle when in contact with these points. The more the body reacts when an energy imbalance is located, the weaker the muscle. In CRA the practitioner typically applies a single, downward push on the wrist of a patient's outstretched arm while also making contact with a specific reflex point on the patient's body. The gentle, but firm push is like a subtle "question" and the muscle reactivity response is the "answer." . . . .
With CRA neither symptoms nor specific diseases are treated. It is not a system of differential diagnosis, but a technique in which the doctor can correct the energy imbalance by finding and treating the cause. In the analysis CRA aims to discover what caused the energy situation whereby dis-ease might flourish. With this information a personalized, specific management plan can be created and implemented to care for the patient as a whole: body, mind, and spirit. With CRA, patients are given hope. Not just hope that they can manage, but hope that the cause(s) will be found and that complete healing will take place . Versendaal claimed that CRA can "test every conceivable condition in the human body . . . help that patient, and know how long it will take for that patient to get well." Testing is done by pulling on the patient's outstretched arm while placing one's finger or hand on one of about 75 "reflex" points on the patient's body. 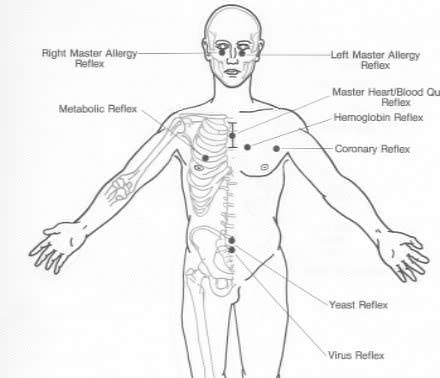 The nine main "reflexes" pictured below, are the "right master allergy reflex," "left master allergy reflex," "metabolic reflex," "master heart/blood quality reflex," "hemoglobin reflex," "coronary reflex," "virus reflex, and "yeast reflex." Others include the "parasite reflex," "vaginal tract reflex," "pineal gland reflex," "virus reflex," "blood quality reflex," "gouty arthritis reflex," "pus reflex," and "yeast infection reflex." Versendaal stated that the front of the hand is electrically "positive," the back is "negative," and the fingers are "neutral." If the arm is weak and can be pulled downward, he had said, the reflex "blows," indicating that disease corresponding to the reflex is present. "Nutritional" products are then prescribed to correct the alleged problems. Until about 2001, most were manufactured by Standard Process Laboratories, but his current approach recommends those of Biotics Laboratories. Versendaal's 1993­-94 schedule listed 27 seminars "given under the auspices of Parker College of Chiropractic" at locations throughout the United States. (Parker's Division of Post-Graduate and Continuing Education assumed sponsorship in 1993.) Seminar attendees were invited to bring a patient for a free examination by Versendaal and told that the index of his textbook contained "1500 conditions with nutritional protocols." One of Versendaal's disciples offered software for practitioners who want to "maximize their effectiveness in balancing body chemistry" and "heighten the professional atmosphere" of their examining room . CRA's "Nine Main Reflexes" More detailed picture. CRA is not a method of diagnosis. It is a means by which a doctor uses the body's reflexes to accurately determine the root cause of a health problem. CRA is also a marvelous preventative technique, used to find a problem before it becomes a full-blown health issue. Find it early and correct it . I no longer feel a need to distinguish between a medical and Chiropractic patient. Every patient (with a few exceptions), now falls into the realm of Chiropractic Care being the most appropriate efficient, and least invasive approach to rectifying the cause of their disease. . . . I am successfully treating chronic acne, Staph. & Strep. infections, infertility, vision loss, dental problems, paroxysmal atrial tachycardia, obesity, allergies, anemia, etc., on a daily basis and with tremendous results . Eighty percent of diseases are due to allergy. The two main causes of disease are gallbladder disease and staph infections. People can only get fat from prostate and ovarian hormones going bad. The most common cause of hair loss in men and women is poor blood. The kidneys are controlled by the thyroid gland. The uterus stores every hormone the body needs. Doctors don't know this: The most common cause of juvenile diabetes is parasites. Yeast infections cause fibroids of the uterus and breast. Most of the skin is made up of calcium (not protein). The most common cause of chronic constipation is parasites. Constipation means that the lymphatics have dried up. The heart rarely wears out unless you are born with a weak heart. Subluxation of the ankle can cause a stiff neck. Rheumatism (rheumatoid arthritis) has three causes: too much calcium in the body, too little calcium in the body, and infection. During the 1992 seminar, Versendaal tested a parade of patients and recommended a Standard Process product for each problem he alleged, typically six or twelve per day of each one. He explained that, "Standard has a product for practically everything that can happen to a man." Since most patients had multiple problems, the typical regimen ranged from twenty to forty pills per day, which would cost the patient from five to twenty-eight cents each. The highest number prescribed was seventy-three, which would have cost about $14 per day. Most of the magic pills are made of dehydrated vegetables and animal organs. In no case did Versendaal obtain a detailed history of a patient's problem or perform any standard type of physical examination. When one woman he examined said she had neurofibromatosis, he asked her what it was. (It is a group of hereditary disorders in which multiple noncancerous tumors appear in the skin and/or elsewhere in the body.) After she displayed some tumors, he tested her reflexes and concluded they were "almost the same thing as fatty tumors" and were caused by "staph." When a woman who smoked asked him to check whether her lungs were damaged, he found a slightly weak "lung reflex," concluded that she had only "slight damage," and advised taking one Pneumotropin pill daily to repair the damage. (He did not suggest that she stop smoking!) When a woman described pain in her hip and leg, Versendaal said it was sciatic nerve pain caused by a "ruptured disk" pinching a nerve in her neck. (The sciatic nerve runs from the lower part of the spine down each leg.) When a teenage girl complained of bronchitis and stomachaches, Versendaal told her the cause was "parasites." When a woman complained of discomfort in her knee and fingers, he diagnosed "carpal tunnel syndrome" in both wrists, concluded that she had rheumatism, and said: "You have adrenal failure, and that's causing your rheumatism. Your body is filling up with poisons from poor circulation from weak adrenals." In other cases, Versendaal diagnosed heart disease, prostate disease, and "infections" of the eye, ear, liver, lung, and knee without examining any of the body parts involved-merely by pulling on the patient's arm while touching the corresponding "reflex" points. In my office, miracles are the norm. When you get started with CRA, God starts sending you patients. He sends you patients nobody can help. . . . There are special people that God chooses-gives the gift of healing. The reason you are here now is because God sent for you." Don't tell patients that they have a disease. Tell them they have a syndrome. Don't write a lot of stuff [in the patient's chart]-the less you have the better. Don't find more than two or three things at a time to treat. If more problems are present, start treating some for three months and then switch to others. That way patients won't be faced with too much expense at one time. A well-respected chiropractic textbook has expressed concern that "CRA's strange interpretation of how the body works must give rise to some concern, leading us to wonder if a CRA practitioner . . . puts patients at risk." The text also wondered why CRA advocates had never conducted scientific studies to see whether CRA practitioners can distinguish people with known illnesses from those without them and whether the supplements they prescribe actually benefit anyone . At various times, Versendaal told skeptical reporters that he was doing research that he believed would validate what he teaches. I did not believe that this was true and have never seen any report of research to which he referred. A search of the PubMed database in August 2014 found no articles authored by him or containing the phrase "cotach reflex analysis" in their title. In 1992, a 50-year-old Pennsylvania woman, in apparently good health, was treated by a chiropractor for hip and leg pain resulting from an automobile accident. When the pain resolved, the chiropractor checked a "thyroid reflex," said she had a "thyroid problem" and recommended dietary supplements that contained iodine. The chiropractor ordered no laboratory tests, standard or otherwise, to measure how well the woman's thyroid was functioning. The prescribed amount of iodine was more than ten times the Recommended Dietary Allowance. Within three months, it stimulated the woman's thyroid to produce excessive amounts of thyroid hormone, which triggered weight loss, severe diarrhea, and other symptoms of thyroid toxicity. The iodine also triggered Graves disease, a thyroid condition in which the eyeballs bulge. The swelling became so severe that, despite medical treatment, the woman's optic nerves were crushed and she is now legally blind. Her lawsuit against the chiropractor was settled out of court with undisclosed terms. Some chiropractic licensing boards that have decided that CRA is within the legitimate scope of chiropractic, and some accept CRA courses for continuing education credit. However, a few chiropractors have been disciplined in cases in which their use of CRA was a factor. In 2001, the Virginia Board of Medicine denied an application for instatement of the license of Edward Kessler, D.C., who practiced in Virginia Beach. The Board's action was based upon findings that, since November 30, 1990 when his license lapsed due to non-renewal, he had been practicing chiropractic in Virginia without a license, that such unlicensed practice was intentional, that he used Contact Reflex Analysis a modality for which there exists to research or scientific evidence to support its efficacy, that his office was in disarray and patient files were incomplete and illegible, that he hd defaulted on student loans, and that he falsified the application for reinstatement of his license submitted to the Board . In 2007, however, the board approved a subsequent application for reinstatement of his chiropractic license. The reinstatement order noted that Kessler had continued to practice CRA and give nutritional advice but asserted that CRA did not constitute the practice of chiropractic . In 2005, the Iowa Board of Chiropractic Examiners revoked the license of Warren Shoemaker, D.C., of Keokuk, Iowa. after concluding that he had engaged in sexual misconduct with a patient, made improper use of CRA, and practiced after failing to renew his license on time . In 2007, Eric Berg, D.C.who operated The Health and Wellness Center in Alexandria, Virginia, was reprimanded, fined $1,500, and ordered to stop using and promoting Body ResponseTechnique (BRT), Nambudripad's Allergy Elimination Technique (NAET), CRA, and testing with an Acoustic Cardiograph (ACG). The consent agreement indicates that Berg had made many therapeutic claims that were not supportable by reasonable scientfic or medical evidence . In 2009, the Wisconsin Chiropractic Examining Board ordered a one-year suspension of the license of Judith Ann Yager, D.C., who has been an ardent believer in his work and has permitted him to conduct training seminars in her office. The board concluded that Yager had (a) practiced while her license had lapsed in early 2005, (b) used a banned device (Toftness radiation detector) to treat patients, (c) practiced outside the scope of chiropractic by diagnosing based on handwriting samples and dreams, (d) brought a chiropractor who was not licensed in Wisconsin to her clinic to adjust patients, (e) improperly engaged in a romantic and sexual relationship with a patient, and (f) provided false information to the Board while being interviewed in connection with the case. The board ordered Yager to (a) pay $3,500 for costs, (b) undergo a mental health assessment, and (c) she take 18 hours of continuing education in patient boundaries, the scope of chiropractic practice, and law and ethics for chiropractors . The published order did not mention the unlicensed chiropractor's name. but I found out from another source that it was Versendaal and that he had rendered diagnoses based on dreams described by telephone and handwriting samples that were faxed to him. After Yager's suspension was publicized, a testimonial quote from her was removed from the CRA Wellness Web site. I believe that CRA leads inevitably to misdiagnosis. Patients who trust its practitioners are likely to waste hundreds or even thousands of dollars treating nonexistent conditions. Patients who seek medical confirmation (or refutation) will face additional cost. The number of CRA practitioners is unknown but is probably a few hundred, most of whom are chiropractors. I believe that all of them should be delicensed and that chiropractic licensing boards should stop approving CRA courses for continuing education credit. What is contact reflex analysis? CRA Wellness Web site, accessed Aug 27, 2009. McLeod CA. CRA at your fingertips. Undated flier for "At a Glance" software) distributed during 1993. Parker College of Chiropractic proudly presents "Contact Reflex Analysis & Applied Nutrition." Flier for seminar in April 1996. Versendaal DA, Ulan F. Contact reflex analysis & applied clinical nutrition: An effective analytical tool for the alternative health care professional. 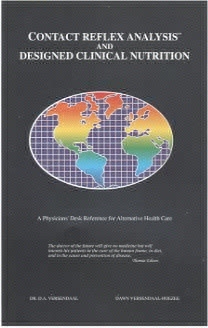 The American Chiropractor, March/April 1998, pp 18-20, 32. Versendaal DA, Versendaal-Hoezee D. Contact Reflex Analysis and Designed Clinical Nutrition. Jenison, Mich.: Hoezee Marketing, 1993. CRA educational materials. Flier from Hoezee Marketing, 1993. Versendaal DA. Contact reflex analysis (flier), © 1992. Koenig KH. Undated letter to Versendaal, acquired in 1993. Cooperstein R, Gleberzon BJ. Chiropractic System Techniques. New York: Churchill Livingston, 2004, pp 88-89. Order. In re Edward Kessler, D.C. Virginia Board of Medicine. Aug 10, 2001. Order. In re Edward Kessler, D.C., application for reinstatement. Virginia Board of Medicine, March 31, 2007. Barrett S. AK/CRA practitioner's license revoked. Chirobase, Feb 17, 2006. Consent order. In re Eric Berg, D.C. Virginia Board of Medicine, Sept 13, 2007. Final decision and order. In the matter of Judith A. Yager, D.C. Wisconsin Chiropractic Examining Board, Case No. LS0908134CHI, Aug 13, 2009. This article was revised on August 23, 2014.